One of the most important questions that you must ask when considering a dive centre with whom to complete your professional level training is “who will teach me?”. 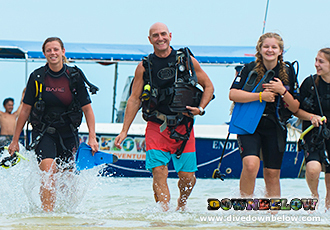 At Downbelow we take all levels of diver training very seriously and when it comes to professional courses we have a dedicated team of highly qualified instructors & course directors with decades of experience in many specialized fields who teach, guide and offer advice to all candidates. Meet the Go PRO Team (pictured above) from left; Lawrencius Jaulit a.k.a. Tim Tam, Mohd Fauzi bin Mohd Sofian a.k.a. Pablo, Azmil bin Aminud a.k.a. Mel (PADI IDC Staff Instructors), Richard Swann (resident PADI Platinum Course Director), Paul Jones (Master Instructor), Streisand Emmanuel a.k.a. Strike & Liz Street (PADI IDC Staff Instructors). PADI Platinum Course Director Richard is already into his second decade of instructor training. As Managing Director of Downbelow Marine & Wildlife Adventures Sdn. Bhd. Richard heads the training team of PADI Instructors. With a wealth of knowledge and experience in all aspects of diver training he plays a vital role in the success of every candidate for our professional courses. PADI Course Directors hold the highest and most respected professional rating in recreational scuba diving. PADI Course Directors are among the dive industry’s most influential opinion leaders and role models. You can read more about Richard in the About Us section. 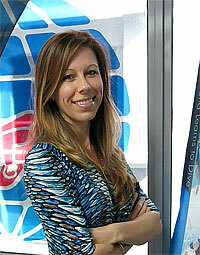 PADI Master Instructor Joanne has been a PADI Instructor since 2001 and teaching Instructor Courses since 2005. Joanne & her assistant Alice will be the people you communicate with when mapping out your professional diving program here at Downbelow. 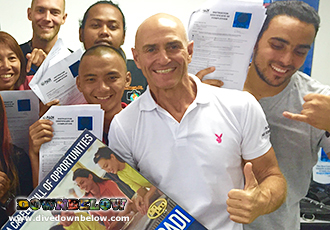 Joanne’s experience and ability to recognize an individuals strength & weakness and put together a tailored professional program at outstanding value for money is the foundation for Downbelow’s exceptionally well run internships & professional courses. Joanne is a Director of Downbelow Marine & Wildlife Adventures Sdn. Bhd. and she brings “business of diving” knowledge with her to the Instructor Courses where candidates benefit from real life experiences of running a dive company. You can read more about Joanne in the About Us section. We first met Paul Jones back in the days when he joined us as a PADI Divemaster for a 4 month Professional Scuba Diving Internship. 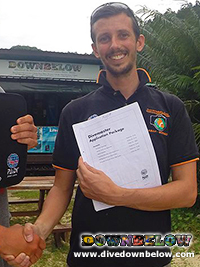 Under the tutelage of resident PADI Course Director Richard Swann and his Go Pro Team, Paul emerged a high calibre PADI Open Water Scuba Instructor. At first he left our shores to continue his world travels, but soon found the call of Borneo too loud to resist, and before long he was was back on Sabah shores to join Downbelow’s team. Since then Paul has qualified as a PADI Master Instructor and continues to impart his skills and knowledge teaching courses from Discover Scuba through to assisting on Instructor Courses.